On June 1 ( Saturday ) there will be a Carbine Compitition at the 400 Yard Range. The Competition will Start at 9:00 AM. This will be open sights and scopes. The Shooting will be from Standing, Sitting, Kneeling, and Prone Positions. On July 6 ( Saturday ) there will be a .17 and .22 Caliber Competition, using any type of sight. This match will be at the .22 Rifle Range. Long Range Competition at the 400 Yard Range. The Shooting Positions will be, From the Bench Only, using Any Rifle, Any Sight. Also on August 3 ( Saturday ), at the 400 Yard Range. IRON SIGHTS will have their own seperate targets. One target at 100 Yards and a Second target at 200 Yards. You can also use any Shooting Rest, Monopod, Bipod, or Tripod, ONLY IN THE BENCH POSITION. On September 7 ( Saturday ) we will be having a Black Powder Competition at the 400 Yard Range. Ball, Paper Cartridge, and Metal Cartridge. Black Powder Guns show up. 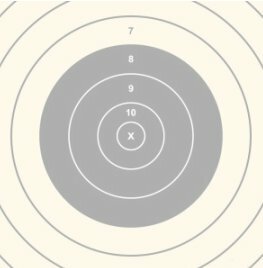 The rifle committee is pleased to announce the annual rifle sight-in. On October 5 ( Saturday ) at the 100 yard range, which is stage 7. We will begin at 9 am and finish at 3 pm. There will be tools to help with scope mounting and other minor rifle adjustments, along with experts to help you make your rifle a straight shooter. This sight-in is Open to the Public, and all are encouraged to come in and check out all our new and Improved Ranges. This is a Free Service Sponsored by the Big Pine Gun Club. Happy and Safe Hunting ! Rifles to be used in High Power Rifle Competition should be equipped with metallic sights, any other type of sights, or scopes. Unless Otherwise Specified. The type of sights you choose on your rifle will determine the sub-division of the rifle. There is a Fee of $10.00 for adults and $5.00 for anyone under 18 years of age. The Photo Above is of the 100 Yard Rifle Range. The 2 Photos Below are of the 400 Yard Rifle Range.